This week has taken awhile to get back into the swing of things! It was exciting to find a package in the mail yesterday from a blog reader! 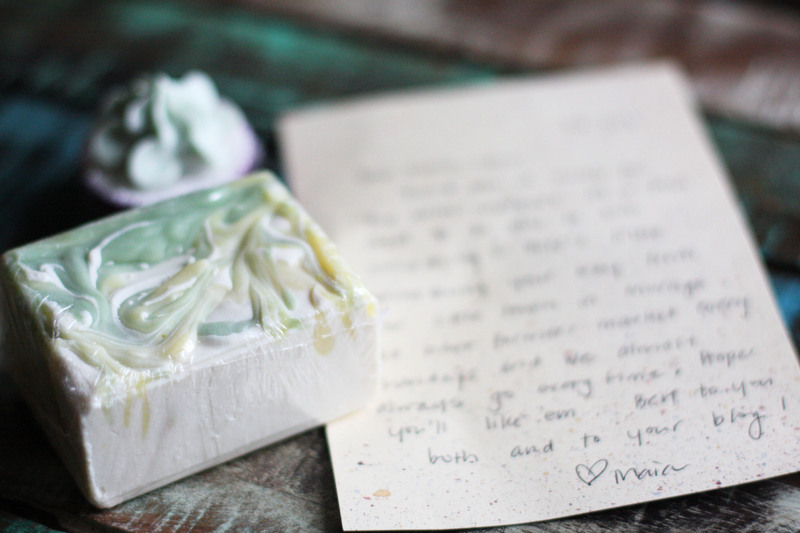 She sent the sweetest note with some beautiful soaps made at her local farmers market in California! It made me realize how much we love "meeting" all of you. This blog has been a lot of fun for us, and we are so glad you are a part of that! Thank You! If you are out and about this weekend there is a fiber festival at the Big E Fair Grounds in Springfield MA. Kara and I are cut off from yarn purchases, so we better stay away! Have a wonderful weekend! So very nice— and how pretty!! Very nice and wow that soap is beautiful!